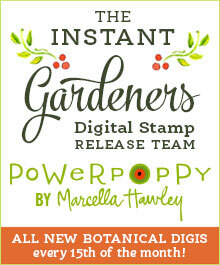 Over on the Power Poppy blog, Marcella Hawley (Peep in Chief!) has suspended the monthly card challenges for the month of September and replaced it with a set of weekly mini-challenges to push your creativity to new levels. The first challenge doesn’t even involve coloring or making a card. Share a favorite quote, saying, or verse that inspires you in the comments section of this blog post. I love this quote because it reminds me that it’s OK if my coloring is not “perfect.” Making mistakes is part of the process and sometimes my “mistakes” end up being happy surprises. Allowing myself to make mistakes was an important lesson that I learned when I sat down one afternoon with the intent of creating an extra special Mother’s Day card for my mom. I knew that I wanted to use the Tulips in Hobnail Pitcher Digital Stamp Set and could envision the layout, but things went quickly downhill after that. I googled images of tulips, browsed Copic blending charts, and tested numerous color combinations. I had recently completed my Copic certification and found myself trying to apply all the new techniques that I had recently learned. But for all that effort, I still wasn’t satisfied. The leaves were flat. All those shades of violet wouldn’t blend. The blues were too bright. By midnight, I ready to scrap my fourth attempt and finally went to bed, despairing that I would ever get the coloring just right. The next morning, I sat down with my partially colored image, looked at all of my “mistakes” and decided that I would just keep moving forward. That’s when the Copic gods smiled and the creativity began to flow. I learned that I could use BV20 to add shadows, pushing some leaves forward and some back to add depth and dimension. A little gray could help blend uncooperative shades of violet. A touch of violet adds subtle highlights to shades of clear blue. And shades of warm gray could produce a neutral, but elegant background. When I let go of perfection, I ended up creating what I still consider to be the best card that I’ve ever colored. So what’s your inspiration? Be sure you share your favorite quote over at the Power Poppy blog. Next week, Marcella will choose one of the submitted quotes to illustrate as a drawing that can be colored in and share it as a free download on the Power Poppy blog! How beautiful, Nancy, and I love how you’ve pulled this unfinished card and continued coloring it to make it gorgeous! I love it, and I love the quote too! Hugs, sweet friend!